Emerald Bay is one of the most beautiful locations in the world and is the reason why it’s our most popular venue. This unique location is a spectacular wedding site. Your wedding ceremony will take place on a bluff at Emerald Bay towering approximately 300 feet over Fannett Island and the tri-colored bay water, offering breathtaking panoramic views of Lake Tahoe. Emerald Bay is surrounded by the Sierra Nevada Mountain Range, a majestic view that encloses the bay and shelters it from the wind and weather. Combine this with the fact that Emerald Bay’s overlook is a secluded wedding location that affords you and your guests privacy for your memorable occasion, inevitably making the bluff over the bay the perfect outdoor ceremony venue. 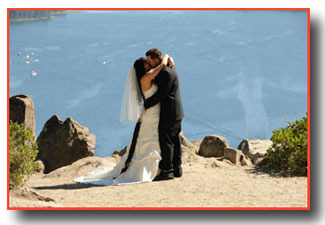 What’s more, with such scenic beauty, the backdrop for your wedding photos will be unsurpassed. One important aspect to consider for your Emerald Bay wedding is our recommendation of limousine services for you and your guests because of limited parking at the ceremony site. This is especially true during the summer season on weekends since this magnificent area is a delight and produces an attraction for sightseers. 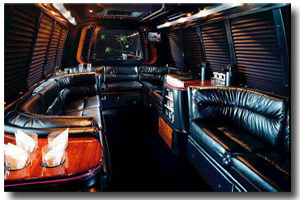 We offer stretch limos that seat up to seven people or a party coach for up to 18 guests (see Party Shuttle Services below). Want a simpler package at Emerald Bay? Parking at Emerald Bay is at times a bit scarce in the summertime, mainly because this incredible area is recognized as a National Natural Landmark that attracts a great deal of visitors each year. Therefore, transportation services are recommended and made available to you and your guests, allowing your entire party to ride in comfort and style to the wedding site. 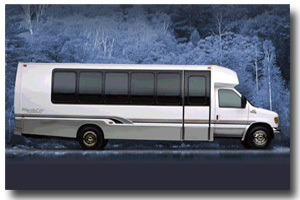 Amenities include seating for up to 18 guests, a stereo system, iPod hookups, DVD player, and complimentary cocktails, all at a price only slightly higher than the cost of a seven passenger stretch limo. Additionally, the limo coach will bring the newlyweds and their guests to the reception site or other appointed destination afterwards.